Teacher Dude's Grill and BBQ: A funny thing happened on the way to the market. Or how I found myself covering a forest fire on my day off. A funny thing happened on the way to the market. Or how I found myself covering a forest fire on my day off. 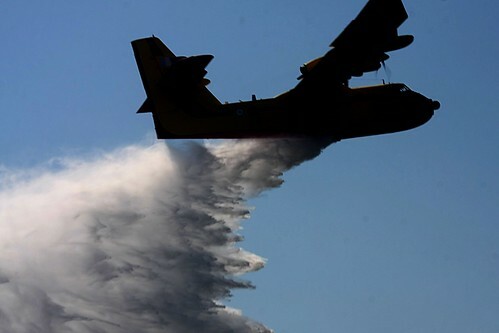 Fire fighting aircraft dropping sea water on a forest fire near Thessaloniki, Greece, a photo by Teacher Dude's BBQ on Flickr. Yesterday proved once again that cameras are like credit cards and we should never leave home without them. My original plan was to go into the centre, find a cafe with wifi and catch up with things on the internet and then do some shopping. 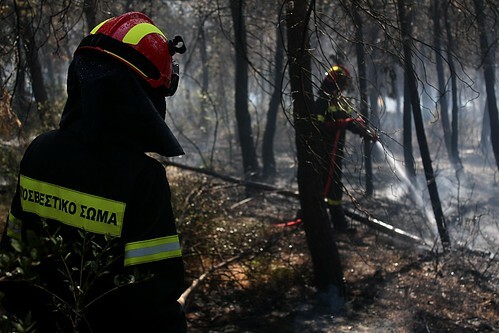 As it turned out I found myself walking for miles in 40C along a dirt track in search of a forest fire. But I get ahead of myself, while tweeting I saw that my friend, Asteris was in the centre as well and went off to catch up on his news and find out how he's spent his time at the Global Voices conference in Nairobi. Later, more friends happened upon us (Thessaloniki is that kind of town, despite having a population of over one million inhabitants). In the midst of catching up and discussing what we planned to do for our summer holidays,I noticed a couple of Canadair fire fighting planes circling over the city. Usually, that means there are off to fight forest fire in the north of Greece but on the off chance that something was happening closer to home I asked Asteris (i think he's never offline, even in his sleep) to check out Twitter and as I'd guessed there was a fire raging on the outskirts of the city in the Seix Sou woods. Quickly grabbing my helmet and my bag I made my way to the site but couldn't get very close ad all the access roads had been closed by the authorities. Instead I ended up parking a mile or so away and trekking towards the smoke. Once again luck was on my side an professional photojournalist was also heading in the same direction and offered me a lift. Also she knew from her job many of the fire fighters on duty so there was no problem about me being stopped or turned away and so I was able to take photographs just a few metres from where the planes and helicopter were dropping seawater on the fire. The only problem was that my bike was at least a 50 minute hike away and the temperature was still in the high thirties but it was worth it and exhausted, red faced and foot sore I ended another Saturday nobody could have predicted.